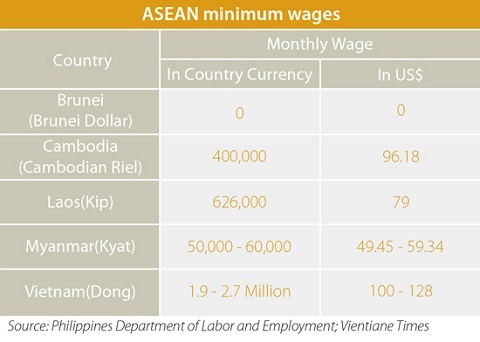 Brunei is the only nation in the 10-nation ASEAN bloc that does not have a legislated minimum wage. While the government currently has no plans to implement one, it is a popular and often controversial topic that has been the focus of several parliamentary sessions in the country – most recently in March last year. Brunei has been divided over the issue of a minimum wage. The introduction of one has been widely welcomed by workers in the country’s public sector, but private enterprises have been fearful that a minimum wage will have an adverse effect on business. Government officials, meanwhile, have stated that a comprehensive study of current operating standards in the private sector is necessary before any legislative action can be considered. Cambodia’s minimum wage currently stands at approximately US$96 per month, but the amount has attracted significant attention in recent months. In particular, Cambodia’s garment workers have been pushing for a salary increase, with independent unions calling for the amount to be raised to US$140. The issue is a pertinent one for the West, with numerous well-known companies such as Nike, Gap and Zara outsourcing production to the Southeast Asian country. Earlier this month, the Cambodian government acquiesced to the demands of its garments industry, but did not fully meet what the unions had been asking for. The minimum wage for the industry will see a 28 percent hike, which translates to around US $123. Whether the increase will satisfy the industry’s workers remains to be seen, but with the Cambodian economy heavily dependent on investments derived from foreign sourcing, it is to be hoped that they are. Laos’ minimum wage has been revised five times since 1991, with the current amount implemented in 2011. According to the country’s state-run media, representatives of numerous key sectors met with the government over the summer to discuss the minimum wage being raised once more. However, no official announcement for an increase has since been made. Myanmar’s minimum wage law was only introduced in March last year, and the country’s Ministry of Labor is still yet to announce what the official minimum wage will be. While standards exist in certain sectors – such as public employees, who are paid a minimum of MMK 50,000 (approx. US $50) per month as highlighted in the above graph – the Burmese government has yet to standardize salaries across other sectors, despite having promised that it would by the end of last year. The government’s delay in implementing a comprehensive minimum wage has been eliciting a strong response from various industries in recent months. 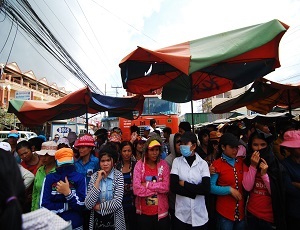 Only last week, workers in a wood processing factory in Rangoon held a strike calling for improved labor rights. An announcement on minimum wages is expected from the Burmese government within the new few weeks. Earlier this month, the Vietnamese government promised to implement a 15 percent minimum wage increase. The rise will be the country’s fourth in just 5 years. In 2010, regional minimum wages across Vietnam grew on average by 9.9 percent; in 2012, by 30.1 percent; and in 2013, by 15.2 percent. For the Vietnamese government, the challenge over the past five years has been to strike a balance between income equality and making Vietnam an attractive destination for foreign investment. The country’s widening income gap threatens to push social inequality to record levels unless the minimum wages rises. Conversely, raising the minimum wage runs the risk of driving businesses away from Vietnam. Whilst next year’s wage hike will ensure that Vietnam has the highest minimum wage of ASEAN’s five smallest economies, businesses needn’t be overly concerned. The country boasts one of the best manufacturing sectors within ASEAN, and its minimum wage will still remain competitive relative to the organization’s biggest economies, which Vietnam is undoubtedly now in close competition with. Growth is accelerating and foreign businesses have been flocking to the country in recent years. Another minimum wage increase is therefore expected and shouldn’t negatively influence future economic progress. In this issue of Asia Briefing Magazine, we explore several of the region’s most competitive and promising manufacturing locales including India, Indonesia, Malaysia, Singapore, Thailand and Vietnam. Exploring a wide variety of factors such as key industries, investment regulations, and labor, shipping, and operational costs, we delineate the cost competitiveness and ease of investment in each while highlighting Indonesia, Vietnam and India’s exceptional potential as the manufacturing leaders of the future.